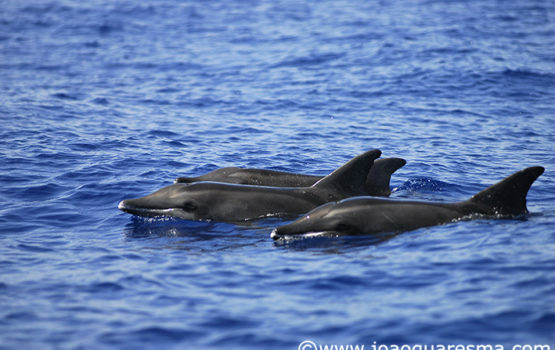 Adult rough-toothed dolphins can grow to 2.6m long, with males slightly larger than females. Average weight is about 160kg. Newborns are about 1m long. There are 19-29 pairs of stout teeth in each jaw. The teeth present many vertical grooves or wrinkles which gave origin to the species name in English. Lifespan is, at least, 35 years. The rough-toothed dolphin is the only long-beaked dolphin which lacks a crease at the base of the melon. Rather the forehead blends into the upper beak. The dorsal fin is tall, wide, and positioned at the centre of the body. The flippers are relatively large, set farther back on the body than in most other dolphin species. 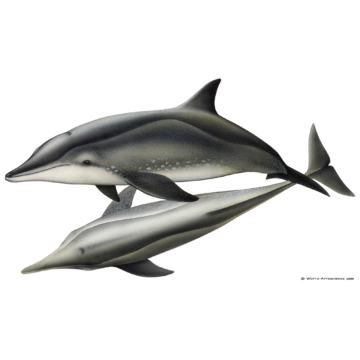 The colouration pattern of the rough-toothed dolphin is complex. The body is dark grey with a dark dorsal cape that narrows markedly between the blowhole and the dorsal fin, then widens posteriorly. The lighter grey sides give way to a white throat and belly, which can present a pinkish tone. There is often considerably dark spotting or flecking on the sides, as well as scars, scratches and spots on older individuals. The tip of the mouth is often white. The eyes are dark shaded. 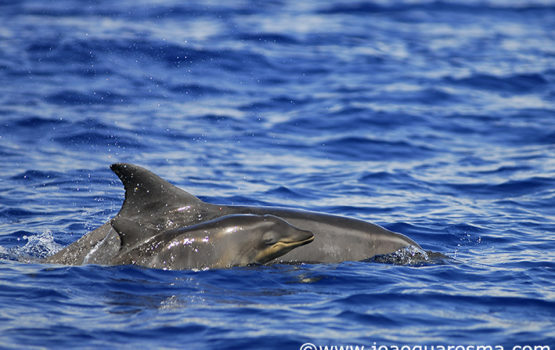 Rough-toothed dolphins feed on cephalopods and fish, including large species such as dolphinfish (mahi mahi). They are capable of deep dives and can submerge for, at least, 15min. 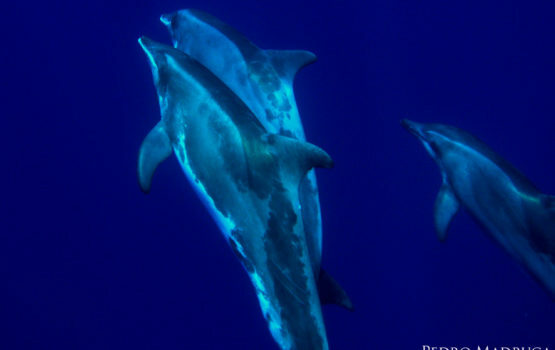 The dolphins of this species have been seen more frequently in groups of 10-20 individuals, although herds of more than 100 have been reported. 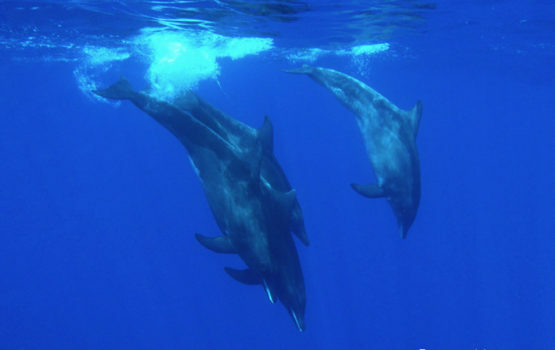 Not much is known about the reproductive behaviour of the rough-toothed dolphins. 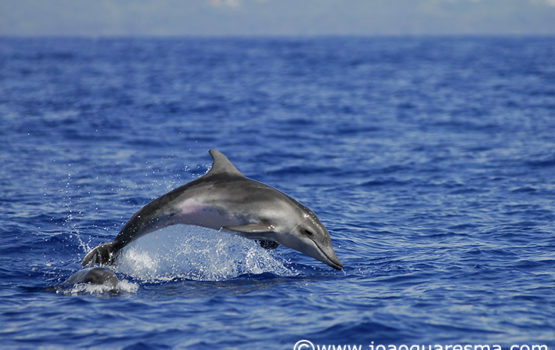 They may appear slow-moving compared to other small dolphins; however, they have been seen moving at high speed with the head and chin above the surface, in a distinctive behaviour. There are reports that they do bowride and exhibit aerial behaviours such as leaps and spyhops; but they can also be difficult to follow at sea. 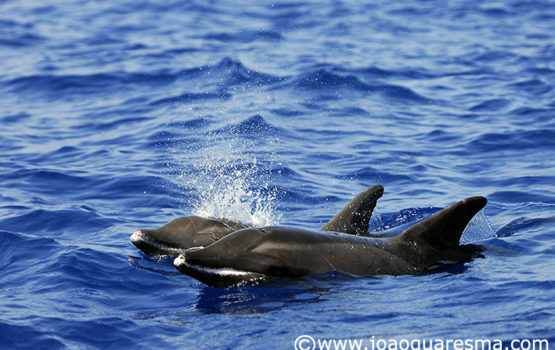 The range of the rough-toothed dolphins is tropical and warm temperate waters worldwide. Usually they inhabit deep, oceanic waters. 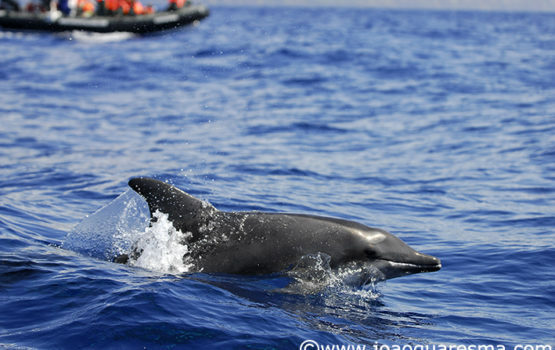 The overall body size, dorsal fin and back colouration could make them difficult to distinguish from bottlenose dolphins (Tursiops truncatus) at a distance. The later are resident in the Azores and are larger, and with a well-demarcated and shorter beak. 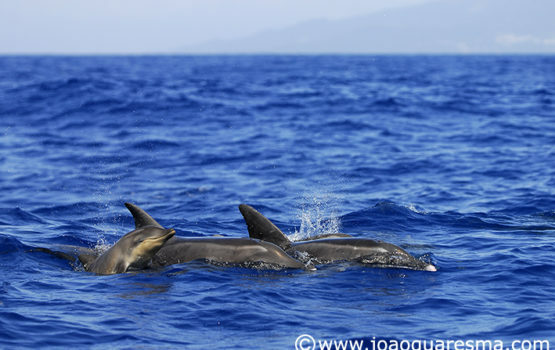 In August 2010, the Espaço Talassa team sighted a group of almost 50 rough-toothed dolphins south of Pico Island. This was a new record for us; the last time that this species was seen in the Azores was during the summer of 1995. The last sighting of this species, so far, occurred in late summer of 2016, when a group of about 20-40 rough-toothed dolphins was observed far offshore. The group was slowly surfacing close to the boat in tight formation and bowriding as the boats were moving slowly forward. The same group was encountered in the morning and afternoon trips on September 28th 2016.